Find data sources and online maps for your geospatial program on this page. Data for GIS comes from many sources and the validity and accuracy varies widely, especially in academic sources. Never use data for legal or mission-critical work unless you know quality of the source provider. Data and maps provided here are for educational uses only and are not warranted by the GeoTech Center for accuracy or appropriateness. Use is at the sole discretion of the user only. If you know of a good source of data and wish to share it contact us . 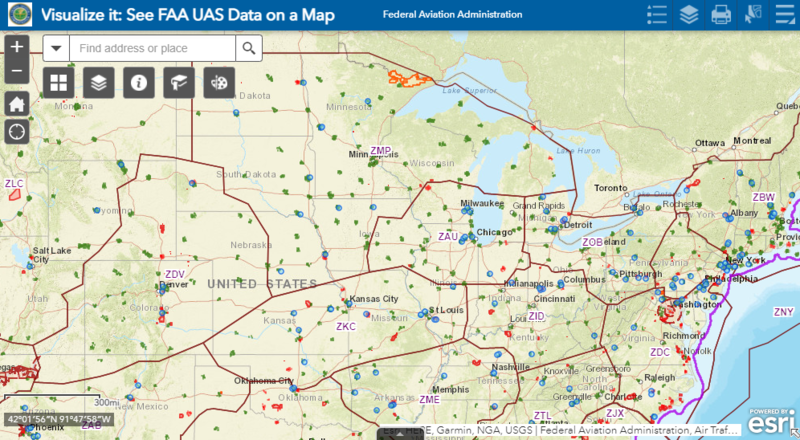 The FAA's online map of controlled airspace around airports and DOD areas in the United States. Data Basin is a free, online system that connects users with spatial datasets, tools, and expertise. Individuals and organization can explore and download a vast library of datasets, upload their own data, create and publish analysis, utilize working groups, and produce customized maps that can be easily shared. The USGS is the nation's largest holder of GIS data and information. The Seamless server provides public access to the terrabytes of USGS data. The National Weather Service produces several data sets that are available in formats available to import into Geographic Information Systems (GIS). GIS is a collection of computer hardware, software, and geographic data for capturing, managing, analyzing, and displaying all forms of geographically referenced information. It takes the numbers and words from the rows and columns in databases and spreadsheets and puts them on a map. TNRIS was established by the Legislature in 1968 as the Texas Water-Oriented Data Bank. In 1972, after four years of growth and diversification, it was renamed the Texas Natural Resources Information System. The mission of TNRIS is to provide a "centralized information system incorporating all Texas natural resource data, socioeconomic data related to natural resources, and indexes related to that data that are collected by state agencies or other entities." National Cartography and Geospatial Center (NCGC) has long been respected for the quality of maps it produces to support various Natural Resource Conservation Service (NRCS) projects and programs. In addition to producing maps, NCGC is constantly researching new digital technologies for creating maps. New techniques and procedures are posted to the NCGC Web site and shared with our customers to use in developing their own maps. NCGC is a major distributor of geospatial data to support NRCS, National, State and local field needs. This award-winning site is the Geospatial Data Clearinghouse for the Commonwealth of Kentucky. A variety of datasets can be located and accessed, static map products can be downloaded, and many internet mapping applications and services are easily accessible via the site. Use the powerful geoportal to locate maps and geographic data content for a particular part of the state or search based on keyword or theme type. The GIS program at the National Center for Atmospheric Research (NCAR) fosters interdisciplinary science, spatial data interoperability, and knowledge sharing using GIS. The goal of our program is to promote and support the use of GIS as both an analytical and infrastructure tool in atmospheric research, as well as using the discipline to address broader issues of spatial data management, interoperability, and geoinformatics within the geosciences. The National Map Seamless Server is the ultimate location to explore and retrieve data. U.S. Geological Survey (USGS) and the EROS Data Center (EDC) are committed to providing access to geospatial data through The National Map. An approach is to provide free downloads of national base layers, as well as other geospatial data layers. The Water Resources Discipline is one of four science disciplines of the USGS . The WRD mission is to provide reliable, impartial, timely information that is needed to understand the Nation's water resources. OneGeology is an international initiative of the geological surveys of the world. This ground-breaking project was launched in 2007 and contributed to the 'International Year of Planet Earth', becoming one of their flagship projects. A one-stop shop for ArcGIS users including ArcGIS Desktop, ArcGIS for Server, 3D Analysis, Imagery, and mobile applications. Provides access to maps and applications, community blogs, forums, videos, and more. ArcGIS.com is a Web site for working with maps and other types of geographic information. Visit the site to create maps; find and use maps, applications, and tools; and share your maps and applications with others. Within the site, you will find applications for building and sharing maps. You will also find useful basemaps, data, applications, and tools that you can view and use, plus communities you can join. Build public-facing or business solution-focused applications quickly by leveraging the ArcGIS Web Mapping APIs along with content from ArcGIS Online. Included are map and task services, content sharing capabilities, and a range of other online resources such as API samples and references, and code galleries. Access to multitemporal, multispectral worldwide Landsat 8 and Landsat GLS data. The ESRI thematic Atlas Sample App is a configuration of web application that uses a collection of intelligent web maps with text, graphics, and images to talk about our world.